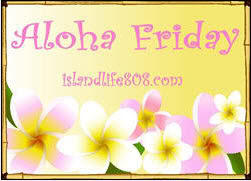 Greetings friends, and happy Friday ;) Wow, did this week whiz by or what? How is it that summer is nearly half-way over and it seems like it has just begun? I love the summer months full of bright flowers, long sunny days, cool splashes in the water, fireflies and evening bike rides. I was a little sad when I noticed this week that the stores are already filling up with back to school specials. Slow down summer! I love Fall, but do you have to fly by in such a hurry? My question for today is simply: Name 5 things, big or small, that you are grateful for right now. My boys (hubby included), husband's job, my friends, opportunities coming my way, and all things Disney. That we can afford the life we have even when it's almost panicky. Family, friends, health, my doggie and my job.